Christo will present two works in progress: “Over the River, Project for the Arkansas River, Colorado,” which will suspend 5.9 miles of fabric panels over a forty mile stretch of the Arkansas River in Colorado; and “The Mastaba, Project for the United Arab Emirates,” which will consist of 410,000 horizontally stacked, multi-colored oil barrels, forming an oblong trapezoidal monument nearly 150 x 225 x 300 m.
For over fifty years, the artists Christo and Jeanne-Claude’s large-scale environmental works of art have juxtaposed the familiar and unfamiliar in rural and urban contexts, allowing viewers to experience landscapes, architecture, and objects with new eyes. The artists have realized numerous artworks including Wrapped Coast, One Million Square Feet, Little Bay, Australia, 1969; Valley Curtain, Rifle, Colorado, 1970-72; Running Fence, Sonoma and Marin Counties, California,1972-76; Surrounded Islands, Biscayne Bay, Greater Miami, Florida, 1980-83; The Pont Neuf Wrapped, Paris, 1975-85; Wrapped Reichstag, Berlin, 1971-95; The Wall – 13,000 Oil Barrels, Gasometer, Oberhausen, Germany, 1999; and The Gates, Central Park, New York City, 1979-2005. Christo was born in Bulgaria and studied at the Fine Arts Academy, Sofia, and met Jeanne-Claude in 1958 in Paris and have collaborated since 1961. The artists permanently took up residence in New York in 1964. Jeanne-Claude passed away in 2009. 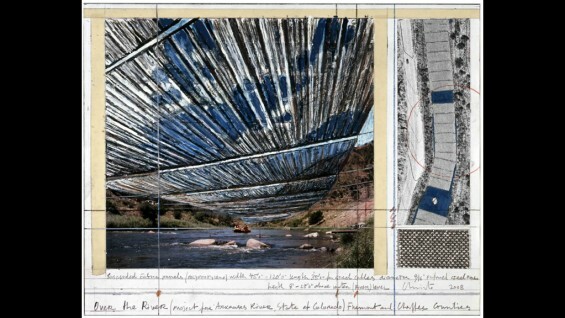 IMAGE CREDIT: Christo, Over The River, Project for Arkansas River, State of Colorado, Collage 2007, 35,5 x 28 cm (14″ x 11″), Pencil, enamel paint, photograph by Wolfgang Volz, wax crayon, aerial photograph with topographic elevations, fabric sample, and tape. Photo: Wolfgang Volz, © Christo.